We hear the tanks, said 23-year-old Fida Qishta. We just want one minute to be safe, Qishta said. “Maybe after a month, but not today,” she thought. It was June 21, 2004, when her house was turned into rubble. Qishta took long pauses, careful with her sometimes halting English, as she told her story to a small group of women at the Islamic Center of New London Wednesday in Groton. A few were Muslim; others were members of the First Congregational Church of Old Lyme who visited Israel and its occupied territories last year. Laila El-Haddad, a Palestinian mother and journalist who writes for Aljazeera.net, joined Qishta in describing the challenges of women living in Gaza, who are prevented from traveling in and out of the tiny territory. Qishta was a teacher, living in Rafah, close to the border with Israel, in 2000 when the second Intifada, or uprising of Palestinians, began. Qishta moved in with her uncle, where it was safer. 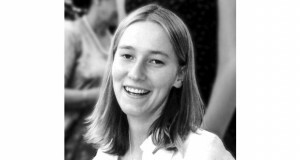 Then one day she saw an American woman on the news, Rachel Corrie. 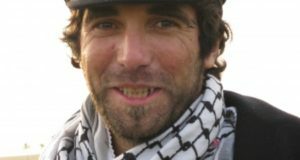 Corrie was killed by a bulldozer while trying to protect a family’s home in Gaza. Back home, Qishta soon realized the smallest events in life had the potential for danger. She was standing on a street, with her mother on the other side. There was confusion with Israeli soldiers about whether they were allowed to cross, she said. One man crossed anyway, and was shot in the head. Qishta found herself at his side and handed him to an ambulance driver. Qishta began helping people empty their houses before they had to leave them. She helped found a nonviolent direct action group of her peers called Rachel’s Way. She also helped found the Lifemaker Center to keep kids out of the street, so they wouldn’t see the demolition and death. She found that women want to do something, but don’t know how to organize, she said. She started holding meetings in a friend’s store to talk about how they could help. El-Haddad, a graduate of the Kennedy School of Government at Harvard, is from Gaza, but she was living in Boston and three months pregnant when she decided to go back. It was a decision she calls “my own personal jihad.” When it came time to give birth, she went back to Boston and delivered her son, Yousuf. But she was soon back in Gaza with him, as one of the few journalists working in the territory. 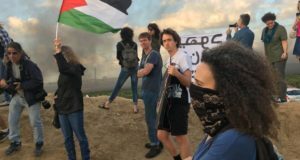 Most journalists stay in hotels in Jerusalem and go into Gaza after the violence is over, she said. She constantly had to pump breast milk so her baby could be fed, she said, because of the possibility she would not get through Israeli checkpoints. “I never knew how many days I would be cut off from him,” she said. When Yousuf was just 4 months old, she had to take him to Cairo to get her passport, and saw lines of cars waiting at the checkpoints in the blistering heat. She could see only the tips of the guards’ rifles and hear their voices, which gave her a feeling of occupation by an invisible force, she said. “It was like a torture game,” she said, not knowing if one would get through. Some women delivered babies at those checkpoints because they couldn’t get to hospitals, she said. She took a donkey cart, navigating steep slopes, to get around the checkpoint. El-Haddad showed pictures of earthen streets and a woman washing dishes in a bowl after her home was destroyed. There were happier photos of the disengagement in the summer of 2005, when the Israelis pulled back, and the Palestinians flocked to the beaches, reunited with family, and re-opened businesses. El-Haddad’s husband, Yassine, grew up in a Palestinian refugee camp in Lebanon. He isn’t allowed into Gaza, and she can’t go to Lebanon. When his student visa runs out for medical school in the United States, she doesn’t know where they’ll be able to live as a unit, she said.